In response to Dear Ancestry.com: Are You Fixing These Problems? (posted 17 January 2019), I received 38 comments on the post, and several via email. One of the email correspondents was a person who has Ancestry and IT experience, and offered knowledge, experience and wisdom for users of Ancestry.com, especially on the trees and the search engines. The comments are detailed and ring true to me based on my experience (and that of others) working on Ancestry.com. This is my opinion, based on some older facts. Two years ago, Ancestry made cuts to their content acquisition and production teams, reducing head count and budget. The charts for the DNA business, while smaller in total $$, looked more exciting. Lots of growth potential there, so money was reallocated. The acquisition and production pipeline takes time to fill or empty. As they slowed down on acquisition, the output has dwindled over time. Personally, I think this is a mistake. I love the DNA business, and am glad to see it grow. But its strength comes from the combination of well-sourced trees with the DNA matches. Well sourced trees requires record collections. They can't abandon the core business, no matter how pretty the charts for DNA growth are. The DNA business is one-and-done without the subscription business behind it, and that requires content. There have been several attempts to kill the Ancestry World Archiving Project, but Anna Fechter just won't let it die. However, she did announce some backend updates that would require a pause in indexing. That was in September 2018 (https://blogs.ancestry.com/worldarchivesproject/?p=2930). No indexing has been done since then. Could be related to Solr, but probably not. Keying data is entirely separate from indexing data, provided the right transforms exist in the middle. There has been a noticeable reduction in the number of record collections available to search. 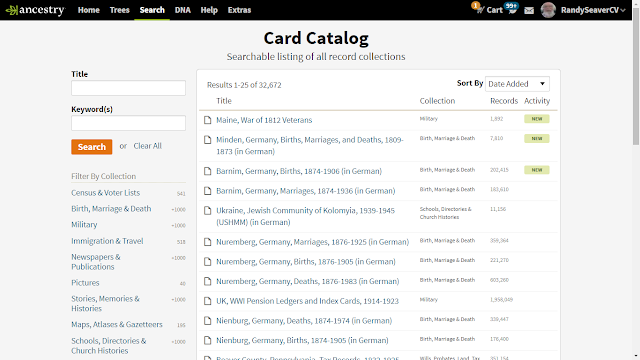 Since 1 January 2018, Ancestry has added 101 record collections (per their Card Catalog), but only 25 since 1 July 2018. In 2017, Ancestry added 244 record collections. In 2016, they added 389 record collections. My correspondent mentions the reduction in head count and budget for the content acquisition and production teams. Combined with the pause in the World Archives Indexing effort, the number of new record collections has decreased. 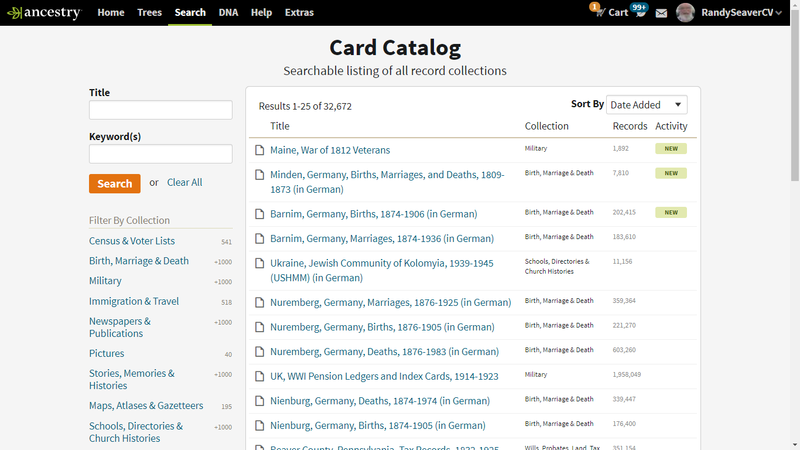 Ancestry has two major income sources from customers - the core business of recurring and new subscriptions for searching record collections (3 million (?) customers paying $200 to $400 yearly for record collections), and the new customers for autosomal DNA testing and analysis (3 to 5 million customers each year paying $59 to $99 one time for the DNA test and resulting information). The company management has to balance all factors to add new customers, satisfy existing customers, invest in personnel and infrastructure resources, and satisfy the corporate executives and investors. Without seeing the details of the budgets year-over-year, it's impossible to say that they have made correct decisions relative to the record collections. Being a private company at this time, they don't have to supply this information. I wish ancestry will address your numerous posts in their speech at Roots Tech. This is a chance to explain and respond to each of the points you've made in this and other posts. Thank you for your efforts. I hope it makes a difference. I would assume the folks at Ancestry are prioritizing new users via the DNA kits with the assumption that the slowdown in adding databases won't cost them many current users, and there will be a large number of new DNA test users who realize that the free Ancestry account is nearly useless so they go ahead and become paying customers as well. It's a user-growth play, and likely pretty successful. It was hard not to notice the big slow down on record database additions, last year, and a def emphasis being placed on the DNA area upgrades. One thought, there was a recent announcement of a partnership with the Danish Archives. That content is extensive and would take quite a bit of resources to initiate. Having an index to those records, along with new color scans, would also be a huge boon, both for Danish researchers, and, to a smaller extent, Northern Germany researchers. If Ancestry's acquisitions team has been reduced, this project might be taking up most of those limited resources. I just realized that the same staff-and-budget reductions that are reducing the number of new collections will probably start reducing the number of RENEWED contracts for collections. That means we need to be more careful than ever to save images to our own disks as we find records on Ancestry. Don't put it on your to-do list; save it right now to an "intake" folder with a decent name, even if you don't have time to examine it this moment.